Over the past two months, filmmaker Eliyahu Ungar-Sargon has been on the road traveling to cities across North America to screen his documentary Cut: Slicing Through the Myths of Circumcision. With 30 stops across the continent, the "Cut Tour" not only gave many people the chance to see this powerful film, it also gave local communities the opportunity to have a serious discussion and think critically, perhaps for the first time, about the controversial subject of male infant circumcision. On Saturday, October 29 nearly 70 people joined Bay Area Intactivists for the San Francisco screening of Cut at Ninth Street Independent Film Center. 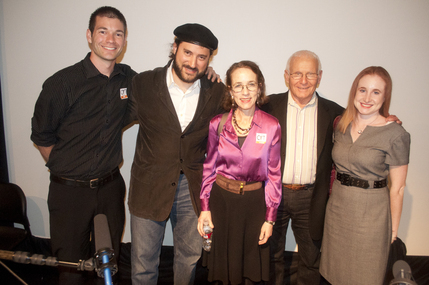 The film was followed by an hour long Q&A with special guests Eliyahu Ungar-Sargon, Dr. Mark D. Reiss (founder of Celebrants of Brit Shalom and Executive Vice President of Doctors Opposing Circumcision), Lisa Braver Moss (author of The Measure of His Grief), and Rebecca Wald (founder of Beyond The Bris). Thanks to The WHOLE Network for organizing the tour and to the members of Bay Area Intactivists whose hard work and financial support made the San Francisco screening of Cut a huge success. Audio from the San Francisco Cut Q&A is available courtesy of The Cut Podcast.